It really is difficult to know what the Buckeyes should root for this weekend. We are down to the final week of the college football season. There is a very limited number of possible scenarios, which means that it’s very easy to know what each team wants. There is also a very small true bubble this year, which makes each team’s rooting interests pretty straightforward. In fact, the only team with any complex rooting interests is Alabama, who isn’t even playing this week. So, let’s get to the rooting interests of our nine teams still alive in the College Football Playoff race. On multiple occasions, I refer to the resumes of the remaining contenders. I present and compare all of them in my Bubble Watch, which is an excellent reference to see while looking at teams’ rooting interests. Clemson: The Tigers are actually the most interesting team this entire weekend. Alabama and Ohio State get all the press, but Clemson has the best resume in the country, by a wide margin. If the Tigers lose a close game to Miami, they still have a chance at the Playoff. The resume will still be better than Alabama’s (as well as a favorable result against a common opponent, Auburn) and Ohio State’s. What Clemson would love to see, though, is TCU upsetting Oklahoma. If the choice is between 11-2 Clemson and 11-2 TCU, Clemson looks to have a big advantage. It’s a little iffier against Ohio State, but Clemson should be rooting against Oklahoma. Miami: Miami can hope for different scenarios as to who it will face in the semifinals and where it will play, but in terms of getting in to the Playoff there’s nothing to root for. It’s win and in, lose and go home. Ohio State: This is the tough one. It really is difficult to know what the Buckeyes should root for. They need Clemson to win. As I said above, Clemson probably stays ahead of the Buckeyes even with a loss. Ohio State also wants to see Georgia lose; that eliminates some of the awkwardness with comparing Ohio State to Auburn and Alabama. Most importantly, though, Ohio State wants Oklahoma to win. Oklahoma losing would complicate things for Ohio State; the Sooners would still have a favorable resume and a convincing head-to-head win. Ohio State just needs to beat Wisconsin in dominant fashion, preferably by a score close to 59-0, and hope that’s enough to convince the committee. There’s not much else the Buckeyes can do at this point. Wisconsin: Regardless of the resume claims, Wisconsin won’t get in with a loss this week. The Badgers would like to see either Clemson, Auburn, or Oklahoma (but not both Clemson and Auburn) lose this week, so that they will play in the Rose Bowl instead of the Sugar Bowl. The much bigger deal is beating Ohio State, though. Win and you’re in the Playoff; lose and play in the Cotton or Fiesta Bowl. Oklahoma: The Sooners have a compelling case that they should be ahead of Ohio State even with a loss. The committee, however, does not seem to be buying it. This year’s committee seems very defense-oriented, and has consistently held that against Oklahoma. So, even if Oklahoma can stay ahead of Ohio State with a loss, I don’t think it can stay ahead of Alabama. Oklahoma needs to win and get in. 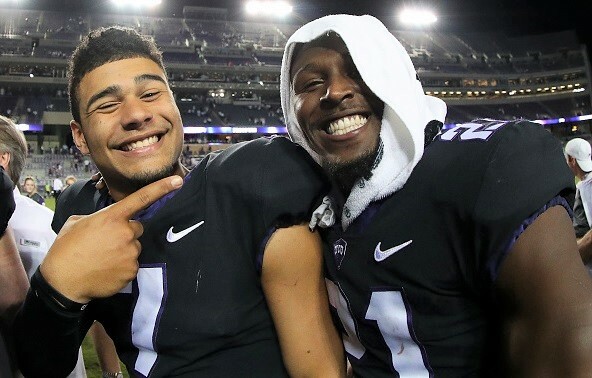 TCU: It’s hard to really know what TCU needs. First things first, the Horned Frogs need to absolutely blow out Oklahoma. Anything short of a massively lopsided victory and TCU is out. TCU also needs Clemson to win the ACC. 1102 Clemson will get in before 11-2 TCU, so the ACC gets two in if both TCU and Miami win. After that, I think TCU wants Wisconsin to win the Big Ten. TCU might have a case if there is a little chaos and the committee has to pick one of three between TCU, Ohio State, and Alabama, but I think TCU’s best path is if the only comparison is between the Horned Frogs and Alabama–with TCU coming off a great-looking win and Alabama coming off a bad-looking loss. Auburn and Georgia: It’s simple for these two. Win the SEC Championship Game and get in. Lose and fall out of the Playoff. Auburn would also like to see a Clemson loss so that the Tigers can stay close to home in the Sugar Bowl, rather than traveling out to the Rose Bowl, which will happen if Clemson wins. Alabama: Alabama has paths to the Playoff, but it’s hard to know exactly what. Alabama’s best chance is probably if chalk holds, aside from TCU upsetting Oklahoma (preferably in less-than-dominant fashion). Alabama’s resume stacks up much better against TCU’s than it does against Ohio State’s. The Tide don’t want to have to be compared to Ohio State. That being said, the Big 12 Championship Game is played first. So if TCU wins, Alabama wants to root for Wisconsin. If TCU loses, however, then Alabama has to root for Ohio State because it has no other chance. Also, Alabama’s resume does not stack up well to Clemson’s at all. The Tide want to see Clemson win the ACC, because if Clemson loses Alabama might get pushed out by two ACC teams making it in.